“Hutton's black-and-white haikus are an exquisite distillation of the cinematic eye. The limitations imposed — no colour, no sound, no movement (except from a vehicle not directly propelled by the filmmaker), no direct cuts since the images are born and die in black — ironically entail an ultimate freedom of the imagination ... If pleasure can disturb, Hutton’s ploys emerge in full focus. These materializing then evaporating images don’t ignite, but conjure strains of fleeting panoramas of detached bemusement. More than mere photography, Hutton’s contained-with-in-the-frame juxtapositions are filmic explorations of the benign and the tragic” (Warren Sonbert). Boston Fire | 1979. 8 min. New York Near Sleep for Saskia | 1972. 10 min. New York Portrait, Chapter II | 1981. 16 min. New York Portrait, Chapter III | 1990. 16 min. Landscape (for Manon) | 1987. 12 min. “Hit with a heavy case of wanderlust” as a young man, Hutton spent 15 years as a merchant marine, and from then on was rarely without his 16mm camera. His gorgeously textured depictions of cities and landscapes are, in his words, “diaristic without being autobiographical,” using long takes and silence to encourage the mind to roam. 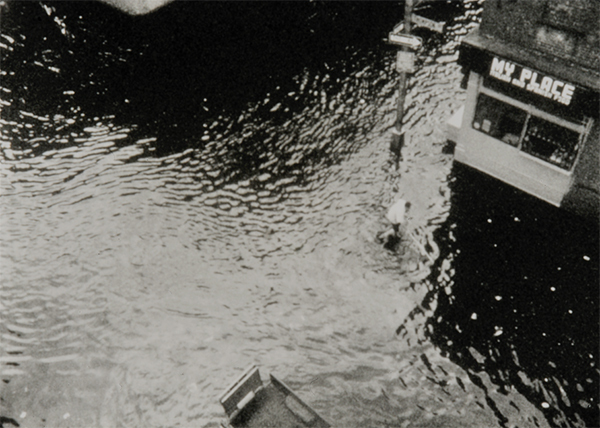 Whether near to home or far away, “Hutton handled his camera like a curious outsider, lingering on the flow of water or the movement of clouds, taking in people in brief, penetrating but oddly distant portraits, not staying in any one place too long” (Max Nelson, Film Comment). Florence | 1975. 7 min. Images of Asian Music (A Diary from Life) 1973-74 | 1974. 10 min. Lødz Symphony | 1993. 20 min. Skagafjordur | 2004. 33 min.